On this page I want to address under the unction of the Holy Spirit the importance of breaking curses, to live the promised scriptural abundant life and to be able to bear fruit for the Lord as scripturally required of us. There are different types of curses, as I'll describe underneath, but a curse in principle holds a person back from living a successful and abundant life in Christ Jesus in one area or in many areas. Info on how to break a curse and curse breaking prayers you'll find on the bottom of this page. Curses are NOT automatically broken when we receive Salvation, become born again. I can confirm that to you, as a deliverance minister having conducted thousands of deliverances on born again Christians, that curses are a reality and that they must be broken to receive breakthrough, healing, deliverance, fruitfulness, abundance and prosperity. I have ministered to many that were simply not able to speak to break a certain curse. The curse is sometimes so powerful that it takes ministry through the Holy Spirit to bring about the breaking thereof. I'm not saying this to frighten you, but to make you realise that dealing with curses is important. So Galatians 3:13 must not be mis-interpreted, the Lord Jesus redeemed us from the curse of the law and more importantly He conquered death, hell an the grave, He overcame all the powers of the Satan the devil, so that now we as born again Christians, as redeemed children of the Father through the precious blood of Jesus, have the authority (Luke 10:19) to break curses in His name, the name of Jesus Christ, the name that is above every name. The Apostle Paul makes an important statement in 2 Corinthians 4:2 "But have renounced the hidden things of dishonesty, not walking in craftiness, nor handling the word of God deceitfully; but by manifestation of the truth commending ourselves to every man's conscience in the sight of God". KJV and the NIV reads: "we have renounced secret an shameful ways". Whatever had been negative in the past towards Christ they had renounced. So besides breaking curses, renouncing the spirits behind them, in the same authority of Jesus Christ, in His name we renounce all oaths, vows, covenants, ceremonies and rituals. If there is a curse effective in your life, due to a word curse, a generational curse, a Masonic curse, a witchcraft curse, a vow, an oath, a ceremony, a covenant or a ritual then that is the legal right, the open door for Satan to attack your life, until you break and renounce that curse in the name of the Lord Jesus Christ. The Bible says in Exodus 34:7 (cross ref Ex 20:5) "Keeping mercy for thousands, forgiving iniquity and transgression and sin, and that will by no means clear [the guilty]; visiting the iniquity of the fathers upon the children, and upon the children's children, unto the third and to the fourth [generation]." KJV. The word generation is printed italic or in brackets, this means that it is not in the original Hebrew text, doing further Bible research this then explains that this is perpetual and doesn't stop at the 4th generation, 3rd and 4th point towards degrees of iniquity and not to generations. So the word of God makes it clear that curses can pass on from generation to generation, that is a generational curse, passed on through the bloodline from the ancestors. Medical science agrees that diseases can pass on generational, as well as addiction or alcoholism, so a generational curse is well understood. The Lord tells us in His word that these generational curses come about as a consequence of sin of the ancestors, hence we must renounce (note it says renounce!, because we cannot and don't have to repent on their behalf, you repent only for yourself) those sins and break the curses going back over all our ancestors, in the general curse breaking prayers as explained underneath, this all written out so that all you have to do is pray them out loud, all 12 pages of them. Often we know of certain possible curses that affect the family line, on the father's and the mother's side. However we normally don't know what sin, vow, ritual, etc. has been committed by all our ancestors, the general curse breaking prayers therefore deal with all curses mentioned in the Bible and are a result of years of experience in deliverance ministry. And far not everything will apply to each individual praying them, but since you don't know which sections would apply, it's better to be safe and break them all. Curses from Witchcraft, Freemasonry, Occult Religions, Vows, Oaths, Rituals, Dedications, etc. There are many other curses, as briefly mentioned above, Witchcraft, Buddhism, Freemasonry, Word (spoken) Curses and then vows, oaths, covenants, ceremonies and rituals. This is not general but specific and is normally dealt with in personal deliverance ministry sessions as they will need to be revealed by the Holy Spirit and there is often demonization. Satan always involves demon spirits (devils, evil spirits KJV) with curses. Amongst other chapters, in Deuteronomy 28 God makes a clear distinction between blessings and curses. The power of life and death is in the tongue, to be continued...soon. 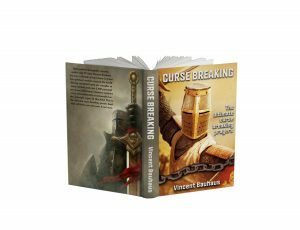 order your copy of Pastor Vincent's book "The Ultimate Guide to breaking curses with powerful results" on the SHOP and learn how to break a spiritual curse in your own life. For specific ministry you can also visit the Personal 1 to 1 Deliverance Ministry and Inner Healing Page to find out all information about ministry and questions to test whether you would need ministry. Info on deliverance from evil spirits and or healing from deep soul wounding through trauma, abuse, rejection. Reverend Pastor Vincent is one of the foremost experts on spiritual warfare, deliverance and inner healing. He can also speak with you about breaking spiritual curses.